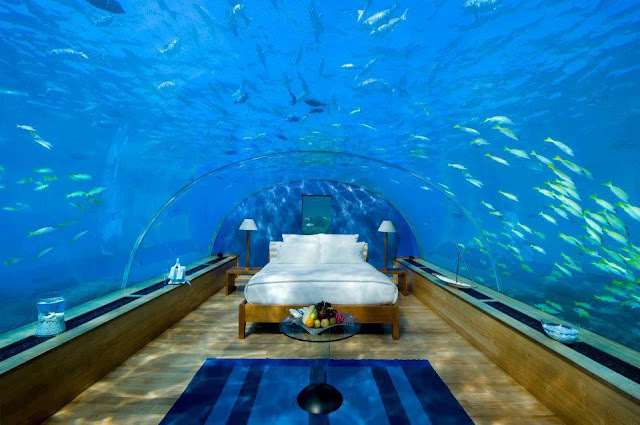 How nice it would be lie on this bed and look at the amazing beauty of the ocean? It's quite magical. This is located at a hotel resort named Atlantis at The Palm in Dubai. The resort is modelled after the Atlantis, Paradise Island resort in Nassau, Bahamas. Almost everything in it is underwater themed. The resort has two accommodation wings, East Tower and West Tower linked by a bridge, with a total of 1,539 rooms. There are two monorail stations connecting the resort to the main section of the Palm Jumeirah islands. In April 2012, Istithmar acquired Kerzner’s 50% stake in the property for US$250m. The property continues to be managed by Kerzner International Resorts. Mr. Tom Dsilva was the developer of the resort. The 5 star resort also includes the 16 ha (40 acres) Aquaventure theme water park, a 45,000 m2 (480,000 sq ft) conference center, and 1,900 m2 (20,000 sq ft) of retail space. The resort also has a Dolphin Bay in which guests can swim and interact with dolphins at Atlantis. The Palm Jumeirah itself is one part of a trilogy including the larger Palms Jebel Ali and Deira, which are still under construction. The Resort kept a young female whaleshark named Sammy in its 11-million litre aquarium. Sammy gained public attention when gulfnews published her story, which started campaigns to have Sammy released back into the ocean. Experts pointed to various signs which showed that Sammy was vulnerable in the aquarium. She was released in March 2010.